Downeast Maine is home to the two most fishing dependent counties on the east coast of the United States. Not only is fishing so important to these communities, lobster makes up over 80% of the total catch! That makes this area precariously dependent on a single species. What would we need to know to diversify and create a new fishery in Maine? From left, Stonington fisherman John Williams, Marine Resources Commissioner Pat Keliher, and Narraguagus High School 12th grade students Bryce Vane and Devin Schoppee discuss an innovative, trap-based winter flounder fishery at the Eastern Maine Skippers Program presentation on Wednesday. 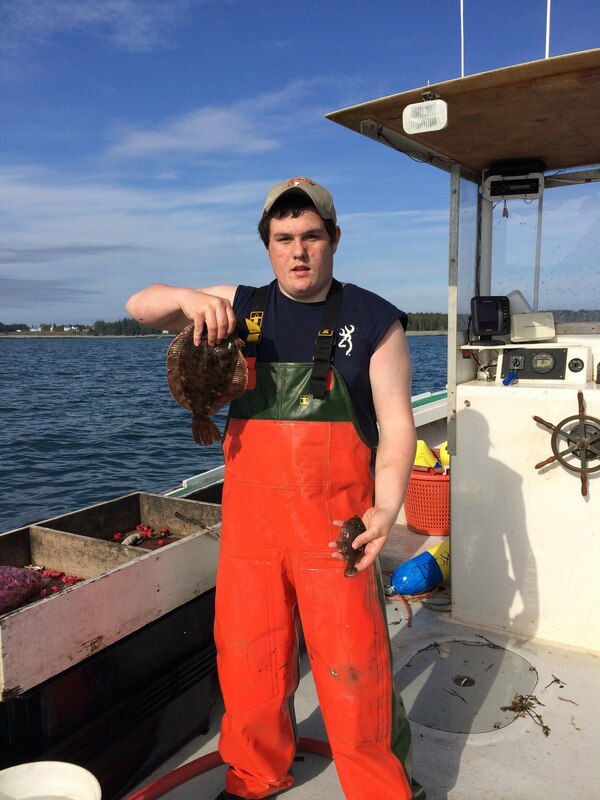 MDI High School 9th grade student Nicholas Lewis shows off the first legal winter flounder caught in a trap designed by students from North Haven and Vinalhaven. presented their findings to Patrick Keliher, Commissioner of Marine Resources. By investigating the viability of a supplemental fishery, students had an opportunity to learn and practice important skills such as active citizenship, public speaking, interpreting and using data, and applied science and engineering that will prepare them for modern fishing careers as well as post-secondary education. The project has further application beyond their high school education, however, as students are conducting "real-world" research that fishermen and regulators can use as they seek to sustain the fishing economies which are so important to Downeast communities. From left to right, Deer Isle-Stonington High School Marine Trades teacher Tom Duym and Ellsworth High School 9th grade students Jillian Dow, Jack McKechnie, and Hayden Sattler cross Penobscot Bay on a lobster boat. In 2012, Deer Isle Stonington High School and Penobscot East Resource Center collaborated to create the Eastern Maine Skippers Program. EMSP is a regional program which aims to provide aspiring commercial fishermen in schools from North Haven to Eastport the skills needed to be successful fishermen in a time of rapid environmental and regulatory change. A cohort of more than 40 students from Vinalhaven, North Haven, Deer Isle-Stonington, Ellsworth, MDI and Narraguagus High Schools as well as George Stevens Academy remain in their schools and collaborate in the program via technology-based "anytime, anywhere" learning. Students also meet in person 3-4 times per year to participate in events such as meetings with the Department of Marine Resources and the Maine Fishermen’s Forum. For more information about the Eastern Maine Skippers Program, visit https://sites.google.com/a/dishs.org/msp/eastern-maine-skipper-s-program. For more information on Penobscot East Resource Center, visit http://www.penobscoteast.org. For more information about the Maine Department of Marine Resources visit http://www.maine.gov/dmr.